ProEssentials WinForm interfaces are used when creating stand-alone client-side EXEs to be distributed and ran on an end-users machine. Thank you for reading this and above FAQ section as it will speed your development and maximize your implementation's overall quality. Knowing our demo and demo project will be your best source of info. See .NET Overview, for additional info. The following information demonstrates how to create your first .NET ProEssentials implementation using the C# language. 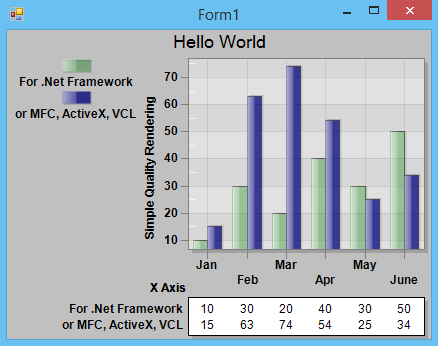 It discusses using the WinForm .NET interfaces to add interactive charting content to your EXEs. Other examples are provided within the product/evaluation. 1) Start Visual Studio.NET and create a new project targeting a [Windows Application] using C# as your language. Accept the name of [WindowsFormsApplication1]. 2) Under the Project menu, select "Project Properties". From the Build tab, adjust the Platform Target setting to x86. This is necessary as the following ProEssentials assembly links to a native 32 bit DLL. This setting will allow the resulting exe to run on both 32 and 64 bit systems and provide the easiest deployment. For native 64 bit, see our ReadMe.txt files in the ProEssentials9/DotNetAnyCpu or ProEssentials9/DotNet64 directories where ProEssentials is installed. If you have already installed the ProEssentials WinForm interfaces, skip to step 4. Left click the [Browse...] button and find the file "Gigasoft.ProEssentials.dll" found in the DotNet32 subdirectory where you installed ProEssentials. 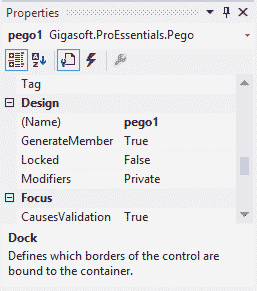 By default, this should be located at "C:\ProEssentials9\DotNet32\"
The [Choose Toolbox Items] dialog should now show 5 highlighted controls: Pe3do, Pego, Pepco, Pepso, and Pesgo. Close the dialog and the 5 new ProEssentials components will be near the bottom of the toolbox. 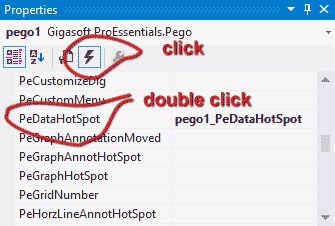 4) Double click the [Pego] tool within the toolbox. This places an instance of the Pego component within "Form1.cs". Left click bottom-right corner of control and drag down-right to fill up client area of Form1. The adjacent image shows what you see. This represents the default state of a ProEssentials Graph. The default state has one subset with four data points. In the course of constructing your own charts, you'll set the properties PeData.Subsets and PeData.Points which define the quantity of data your chart will hold. You'll then pass data via the PeData.Y[subset, point] two dimensional property array. The following section shows example code of passing data. ProEssentials uses the terms Subsets and Points but you can think of these as Rows and Columns. Passing data is as simple as filling each Subset with Points worth of data. 5) Note, when setting color and font size attributes, we recommend setting the parent Form's versions as ProEssentials will use the parent form's settings to help facilitate a uniform look among sibling controls. If new to C#, the (Name) property is probably the most fundamental property as its name is reflected in all code. 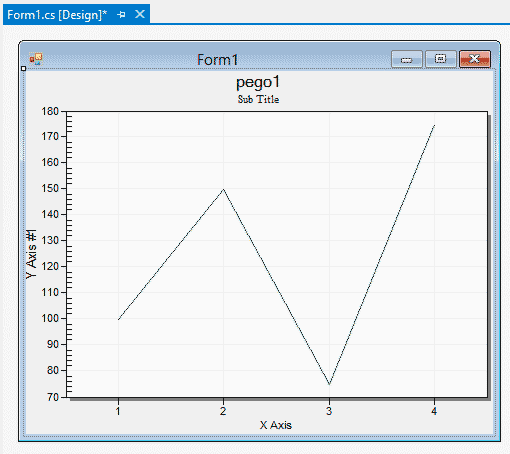 For example, pego1.PeData.Subsets = 1; is a line of code, and it shows how the (Name) property (pego1) starts the line. 6) Double click Form1's Title/Caption Bar to open the code view for "Form1.cs" with default Form1_Load event initialized. The cursor will be within the Form1_Load code section, enter the following code into this section. 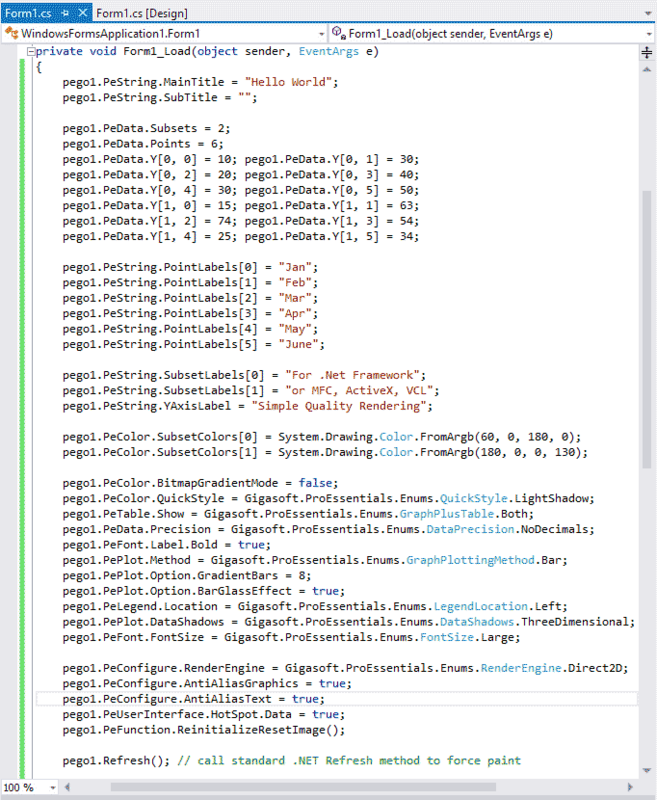 You can copy and paste if you must, but hand-typing at least some of this code will really help familiarize yourself with the Gigasoft.ProEssentials namespace. Note: adding the following using declaration at the top of "Form1.cs" will shorten enumeration syntax. 7) The code above enabled the DataHotSpot event, so we should place some appropriate code in the DataHotSpot event. Left click the pego control within Form1 to give it the focus. Within the [Properties Window], click the event icon. This opens the code view of "Form1.cs" with cursor within the pego1_PeDataHotSpot event handler. Add the following code to the pego1_PeDataHotSpot event. 8) Save and run the project. Your project will show an image as follows. Move the mouse over a bar and click to trigger the DataHotSpot event. Please read the remaining sections within Chapter 2 and review the demo code and documentation that's installed with the eval/product. 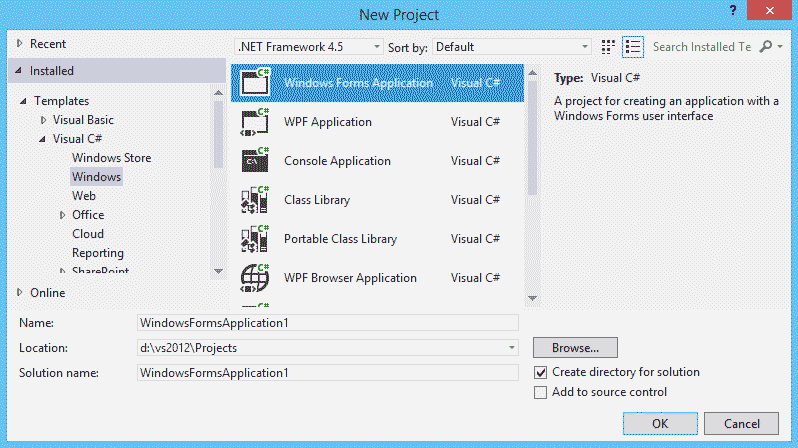 Note that our main demo is replicated in C#.NET, VB.NET, Visual C++ MFC projects all accessible from the start menu. These are great for modifying an existing demo to test potential modifications before implementing within your applications.